It’s rather unfortunate that everything has to be an innovation these days. Even worse, is that for a business to be effective, it seems they must drive disruptive innovations. Innovations are simply inventions that have been successful in the market, those inventions might actually business model changes that have been successful in penetrating the market. I personally find that looking at innovation as a framework to analyze business pressure to be extremely interesting. I did this today in an interview and it felt really good as I was able to create context around changes impacting the health insurance industry. 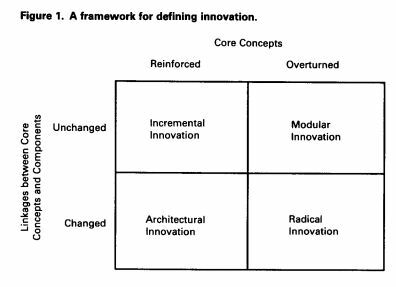 Several years ago I wrote about the 4 types of innovation, Incremental, Modular, Architectural, and Radical. This is a bit different than the framework that Christenson argues, since he only looks at 2 types, Incremental and Disruptive. I believe that disruptive encapsulates both Architectural and Radical. Architectural changes are business model innovations while making a very similar product but one that significantly undercuts existing businesses or creates a new market. While Radical innovations creates a new market but also attacks existing customers, through a new business model and a completely different type of product. Think of a fan competing against an air conditioner window unit, while central air is an architectural change for the window unit. I believe that this framework is just as useful for businesses to analyze their environment as Porter’s 5 Forces because it forces businesses to confront the disruptive innovations that they might have overlooked otherwise. 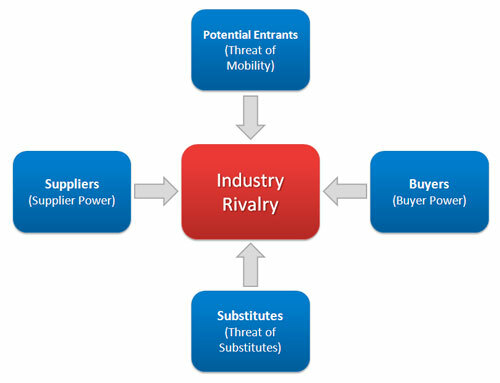 Without using this framework it is likely that businesses would ignore the new entrants force as they don’t feel that those businesses will ever compete with them. However, based on historic evidence those entrants that have a different business models or a different metrics for their performance eventually supplant incumbents. I believe that this type of analysis should be conducted annually or bianually as many industries and markets have continually increasing uncertainty and faster rates of change than historically. This entry was posted in Innovation and tagged analysis, Business analysis, business model, business pressure, Innovation, innovation strategy, Leadership, strategic planning using innovation, strategy. Bookmark the permalink.